We are engaged in rendering Roof Coverings to our patrons in the market. 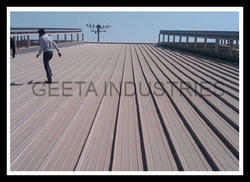 Specialized services we offer is supplied in all kind of polycarbonate, pre coated sheet and varied accessories. We also provide installation services for these varied services on turnkey basis. New customers enjoy complete support in converting their existing projects to Inkera inks and effects. Existing customers are visited regularly to ensure print calibration is according to settings. Matching up with the ever increasing requirements of the customers, our company is engaged in providing Roofing Sheet Installation Service. Owing to our rich industrial experience and expertise in this domain, we are involved in rendering Roofing Sheet Installation Service. At most reasonable rates, we are providing Roofing Shed Installation Service to our patrons. We are pioneered in providing the Roofing Sheets Installation Services to our client at the best available market rates with high end quality. We are one of the well-established service providers of Roofing Sheets Installation Services.